How can I find the prodcut id? From your admin dashboard click on “Products” admin menu. You will see “post=38” the 38 is the product id. Product Sub ID or Price ID what these things mean? This is the most important part, it is actually what the user buy and it cant be 0 and should be unique per product also it is recommended not to change it. If you want to change it for any reason just click on it. Where can I find the Product Sub ID or Price ID? When you create or edit a product the “Product Prices” window contains “ID” column, this is the product sub id or price id. How Tajer checks the user country and state for taxes? Tajer looks for user meta keys that you specified in the Tajer settings page in order to know the user country and state. This because we don’t want to limit you to a specific Login/Registration plugin/form. For example, if you have a registration plugin like our Profile Builder add-on for Forms Management System plugin or our Elegant Profile Builder plugin you can very easily create a country and state custom fields and take their meta keys and put them in the Tajer settings page. If you use the default WordPress forms to allow your users to register then you can use this plugin for example in order to add country and state custom fields to your registration form. If you use another registration plugin then check the plugin documentation or ask the plugin author if you don’t know how to add custom fields in your plugin, the plugin should save the value of country and state fields as a string. Tajer looks for user meta keys that you specified in the Tajer settings page in order to know the user Country, State, City, Postcode, Address 1, Address 2, Phone, Company, etc. This because we don’t want to limit you to a specific Login/Registration plugin/form. For example, if you have a registration plugin like our Profile Builder add-on for Forms Management System plugin or our Elegant Profile Builder plugin you can very easily create these custom fields and take their meta keys and put them in the Tajer settings page. If you use the default WordPress forms to allow your users to register then you can use this plugin for example in order to add these custom fields to your registration form. 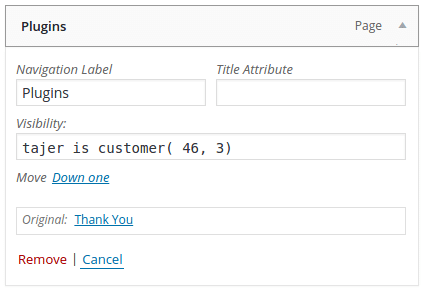 If you use another registration plugin then check the plugin documentation or ask the plugin author if you don’t know how to add custom fields in your plugin, the plugin should save the value of these fields as a string. How the upgrade system works? The upgrade system just replaces product sub id for the user, the user will look like if he/she had bought this sub id from the original. The best practice is to setup your upgrade settings to allow your customers to upgrade from smaller product sub id to greater one, for example from product sub id 1 to product sub id 2 or 3. The user will have all the privileges of the new sub id, for example he/she will have access to the files that attached only to this new sub id and in case of software licensing add-on if the previous sub id is allowed for 3 websites and the new sub id is allowed for 5 websites, the allowed websites for the user will be 5 websites. If the previous sub id is allowed for 500 number of downloads and the new sub id is allowed for 1000 downloads and the user downloaded the files 400 times now the remaining number of downloads for the user are 600 times. If the user bought the product on 2015-05-14 and the expiration date is after one year that means the expiration date will be on 2016-05-14 and the user made upgrade to the new sub id on 2015-08-14 now the expiration date will still calculate from the purchase date which is 2015-05-14 if the new sub id is also allowed for one year then the expiration date will still be on 2016-05-14 but for example if the expiration date for the new sub id is 6 months now the expiration date is on 2015-11-14 and vice versa. How the recurring (renew) system works? The renewing process will extend the expiration date and number of downloads for the sub id. If the user bought the product on 2015-05-14 and the expiration date is after one year that means the expiration date will be on 2016-05-14 and the user made a renew on 2016-03-14 now the expiration date will be on 2017-05-14. If the number of downloads that allowed for this sub id was 500 and the remaining number of downloads was 100 when the user made the renew now the new remaining number of downloads are 600. When I open a product at the frontend I get 404 not found? Please go to your admin dashboard then navigate to Settings->Permalinks and click on “Save Changes”. How to refund a payment? First login to your account on the payment gateway website that the user used when she/he pay for you and refund the payment from there, now from your admin dashboard navigate to “Products” → “Orders” found the order that you want to refund and click on the “Edit” button near to it, a modal form will be opened change the order status to “Refund” from “Status” field and click on “Update” button. How can I add product(s) to a user manually? How can I create custom buy now/add to cart link in order to use it in the pricing table or in anywhere? http://yoururl.com/cart/ is the link to your cart page. tajer_action=buy_now now the user will redirect to cart page and he/she will find just this product to buy it, you can use tajer_action=add_to_cart to redirect the user to the cart page and adding this product to his/her cart. In this case, a dialog will appear when the user clicks on the link and will tell him/her that the product added to her/his cart and will give him options to either checkout or continue shopping. Please note this dialog only appear in case of tajer_action=add_to_cart. product_id=121 is the product id that you want to create this link for. product_sub_id=1 is the product sub id(the price id). If you want to create a link/button within a post or page or custom post type or anything like that from the WordPress admin you can use Purchase Link Generator dialog to do that, simply click on Insert Product button and the dialog will appear with a lot of options. How can I restrict widgets access for only buyers of specific products? First install & active Widget Logic plugin, now to restrict the widget access for only buyers of the product id 46 and product sub id 3 use tajer_is_customer( 46, 3) in the “Widget logic” field that will appear on your widget. If you couldn’t find what you are looking for please contact us. How can I restrict menu items access for only buyers of specific products? First install & active Menu Item Visibility Control plugin, now to restrict the menu item access for only buyers of the product id 46 and product sub id 3 use tajer_is_customer( 46, 3) in the “Visibility” field that will appear on your menu item. Can unregistered users buying products? By default the user must be registered(or you can use “Tajer Session” add-on) in order to use many of Tajer functionalities(for example, if the user is unregistered and tries to add a product to his/her cart Tajer will tell him/her to register first in order to do that). Please visit the Requirements & Tested With page.